The cute and adorable Chu that we first met in Chu’s Day is back and is getting ready for school. Chu is worried about if everyone will be nice or if everyone will like them. After assurances from his parents he heads to school. The teacher wants the class to introduce themselves to each other and tell what they do best. The teacher writes each student’s name on the chalkboard. But there isn’t enough room, so she has to erase…which creates a lot of chalk dust. And that results in something that Chu does best. This is another good story about the first day of school. I like how there are fun details about the classroom (alphabet animals on top of the classroom and such). And of course when Chu starts to sneeze he puts his goggles on. So many cute details. 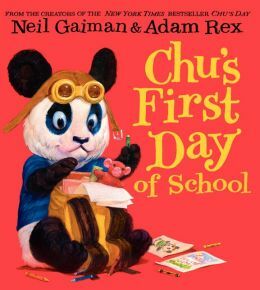 But over all, young readers will be reassured that even if they do something big (like Chu’s gigantic sneezes) school can still be fun, kids will still be nice, and teachers will still like you. This book is part humor and part a comforting bowl of chicken noodle soup for the nervous newbie kindergarteners. Fun. Make goggles to wear when you sneeze. Learn what other cultures say in response to people sneezing. Sing the alphabet song and write your alphabet letters. Write your name on a chalk board. August 4, 2014 in animals, book review, picture books, preschool.